Mahindra release their highly anticipated limited edition black mHawk Pikup. National Manager, Ankit Taneja says "We are very excited to announce that this is the first time that Mahindra has offered a limited-edition vehicle to the Australian public. It was designed in Australia, for Australian conditions." Aussies can expect the same grit and power Mahindra is known for, featuring a 2.2 litre turbo diesel engine and 6 speed manual transmission. However, this limited edition Pikup is also perfect for those special occasions, sporting an all-new classy exterior with 17-inch black rims, black alloy sports bar and black side steps. If that's not enough to excite, throw in a custom black decal set and black flares and factory black bulbar for good measure. Whether it's a night out in town or working hard on the job, the Black mHawk Pikup will seriously impress and Mahindra backs it with 5 years limited warranty and road side assist. Other features include but are not limited to sat nav, reverse camera and ISO fix, designed for ultimate comfort. Pricing starts from just $38,990, see your local Mahindra dealer for more details while stocks last. 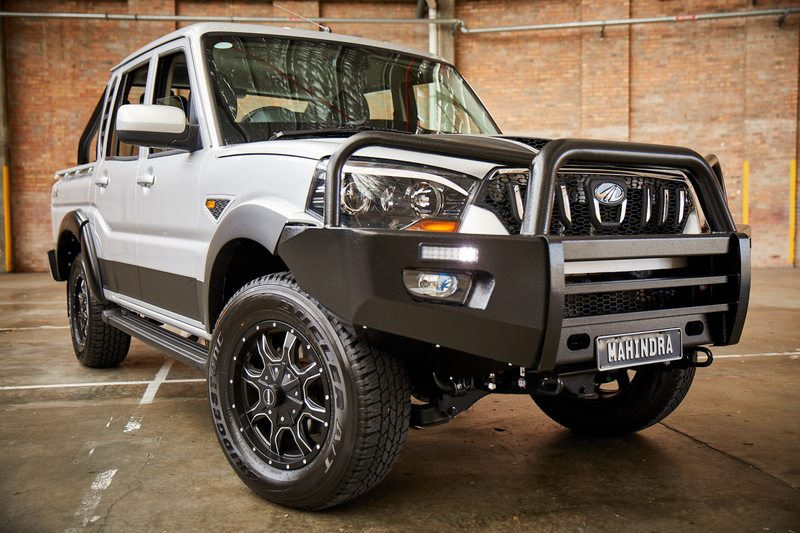 In addition to the release of the Black mHawk Pikup, Mahindra is also offering a great deal for all Tradies. For a limited time only, customers can drive away in a 4x2 Single Cab S6 Turbo Diesel Ute from just $23,990. This incredible deal is inclusive of general-purpose aluminum tray, Bluetooth and cruise control a free ladder rack and tow bar, ensuring Mahindra delivers value for money. Tradies can also opt for a 4x4 Single Cab S6 Turbo Diesel at only $26,990, that includes a free GPA tray (worth over $2000 in retail value). All Mahindra Pikup vehicles have Eaton differential locking as standard, giving traction automatically when needed in real time. Whatever the trade, customers can expect the Mahindra Pikup to handle any task, with a braked towing capacity of up to 2.5 tonnes, while maintain a payload of 1 tonne, with excellent fuel economy. The Mahindra Group is a USD 20.7 billion federation of companies that enables people to rise through innovative mobility solutions, driving rural prosperity, enhancing urban living, nurturing new businesses and fostering communities. It enjoys a leadership position in utility vehicles, information technology, financial services and vacation ownership in India and is the world's largest tractor company, by volume. It also enjoys a strong presence in agribusiness, aerospace, commercial vehicles, components, defense, logistics, real estate, renewable energy, speedboats and steel, amongst other businesses. Headquartered in India, Mahindra employs over 240,000 people across 100 countries. 4/20 Buttonwood Place, Willawong, Brisbane, QLD 4110. 2019 Mahindra limited edition Black mHawk Pikup featuring a 2.2 litre turbo diesel engine and 6 speed manual transmission and an all-new classy exterior with 17-inch black rims, black alloy sports bar and black side steps. 2019 Mahindra limited edition Black mHawk Pikup TVC.